← WHAT “RECOVERY?” WHO CAN AFFORD ANYTHING? PART 2: WHAT “RECOVERY”? WHO CAN AFFORD ANYTHING? Who can afford anything? Not many people, it seems. As noted in yesterday’s post, half of America cannot afford the house they are “buying,” while at the same time rents are skyrocketing, with the number of people who pay half their salary in rent has gone up. If you make more than $27,520 a year at your job, you are doing better than half the country is. But you don’t have to take my word for it, you can check out the latest wage statistics from the Social Security administration right here. But of course $27,520 a year will not allow you to live “the American Dream” in this day and age. After taxes, that breaks down to a good bit less than $2,000 a month. You can’t realistically pay a mortgage, make a car payment, afford health insurance and provide food, clothing and everything else your family needs for that much money. Indeed, food prices are up a shocking 19% between December 2013 and March 2014 as indicated by the chart found with this story: “The Real Inflation Fear–US Food Prices are up 19% in 2014.” Granted, prices had dipped to a low for the year by December 2013, but prices are still higher in 2014 than they were in 2013. 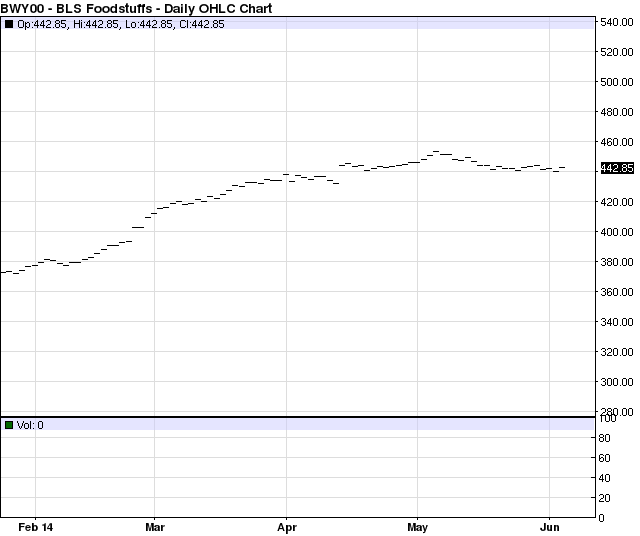 But it’s worse than that–since this Zero Hedge story linked above, food prices have gone even higher. In the Zero Hedge story linked above, the spot price was 432.38. If we search for the same chart today, we see that the latest chart is from two days ago, June 3, 2014. The spot price on that chart is 442.85. Steadily climbing, in other words, a few instances of falling (slightly) notwithstanding. Now, there are several directions one could take this story after these revelations. One is this: I watched a Kiplinger video yesterday that so incensed me I could barely write about it. So I will barely write about it–the link I clicked on to get to it was enticing, something along the lines of “3 reasons why you’re broke and how to fix it.” Paraphrased, their solutions were: 1) don’t keep up with the Joneses, 2) don’t keep making minimum payments on credit cards–pay them off, and 3) don’t play the lottery, invest that money in a Roth IRA. I don’t have the energy to go over each one of these outrageous “solutions,” but suffice it to say that the above bit about half of people making less than $30K a year while food prices keep steadily climbing are at least two reasons why Kiplinger’s advice is not only useless, it’s extremely insulting. But where I really think this story needs to go from here is to remind everyone that while you have to perform labor for your money, banks get it for free, in at least two ways. 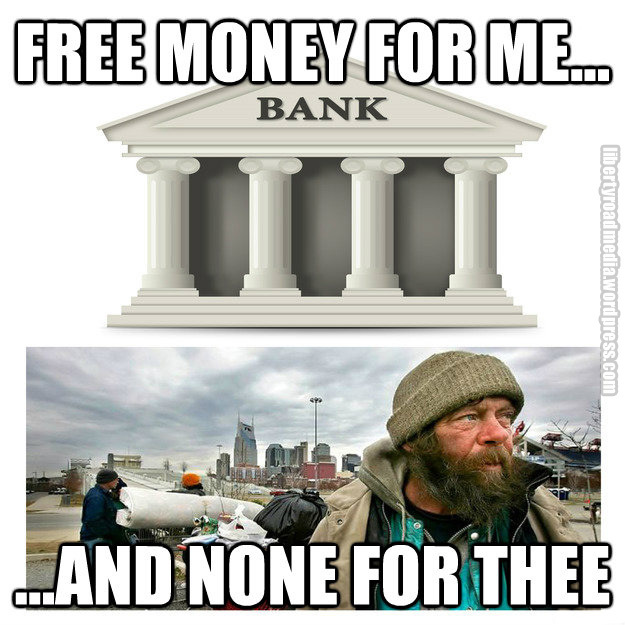 The second way banks get free money is through good ol’ QE–quantitative easing. According to The Economist Magazine, the Fed creates “electronic cash that did not exist before” and gives it to the banks in “exchange” for “securities” that, by the way, are supposedly “backed” by the promissory notes that we have given them. Full circle jerk, in other words. Great work if you can get it–but you can’t. So 1 out of 2 people reading this will make less than $30K. 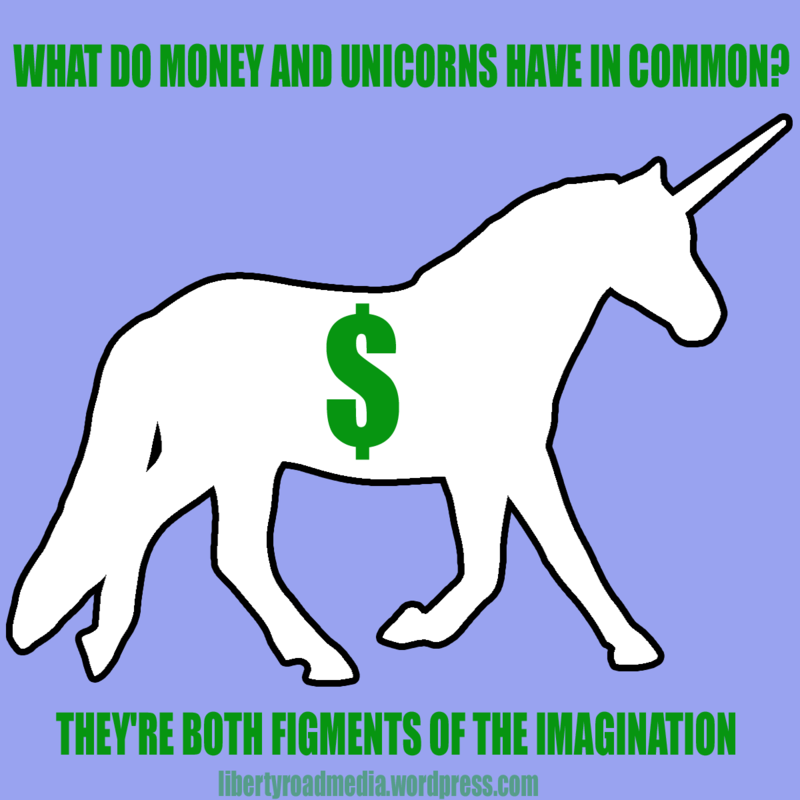 Think about the unlimited money that the banks get–for free–versus the less than $30K you get working full-time. Is this how it’s supposed to be? I don’t think so, do you? This entry was posted in "supply and demand", class war, Crap-italism, Debt, Debt Slavery, Everything Is Rigged, Federal Reserve, Feudalism, fiat currency, Financial Terrorism, Financialization, Paper terrorism, Price, Price-fixing, QE unlimited, Redistribution, Reverse socialism, Too big to fail, Wage slavery, Wages, Wealth transfer and tagged bailout, BLS, debt slavery, Everything Is Rigged, Federal Reserve, fiat currency, foodstuffs, inflation, promissory note, QE, The Economist, wage slavery, Zero Hedge. Bookmark the permalink. 2 Responses to PART 2: WHAT “RECOVERY”? WHO CAN AFFORD ANYTHING? After all the free money from thin air, and the debt the banks burden you with, they come back every few decades to steal any wealth made and all the properties they can get their dirty hands on.